The terrorist destruction of the World Trade Center on September 11, 2001 was the climax of a course plotted by Osama Bin Laden to bring about his apocalyptic vision of a decisive clash between the Western and Moslem worlds. This timely volume details the organizational workings and belief system of Bin Laden's brutal campaign. The authors explore the background and objectives of the attacks, the elaborate planning that went into them, and the process of their practical execution.In addition to its factual account, The Globalization of Terror makes a significant contribution to scholarly and theoretical research dealing with international terror. The book offers a unique analysis of the Afghan "alumni," who had previously fought the Soviets in the 1980s, within the overall tapestry related to modern international terror. The authors detail how their activities evolved from a movement of national self-defense to the militant worldview identified with radical Islam. The book reveals, as well, the organizational structure so carefully erected by Bin Laden and his associates, in order to realize the vision of a worldwide Islamic Caliphate in practical terms. 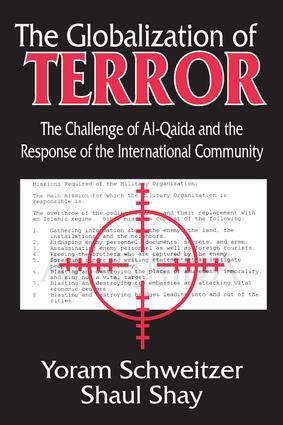 The book is intended to work as a set of guidelines for newcomers to the world of international terrorism including anti-terror task forces, heads of security companies as well as professionals in the field.The importance of The Globalization of Terror lies in its clear presentation and precise analysis regarding the dimensions of the danger international terror poses to the free world, and in its recommendations for the necessary strategy to prevent the recurrence of acts of large-scale terror.